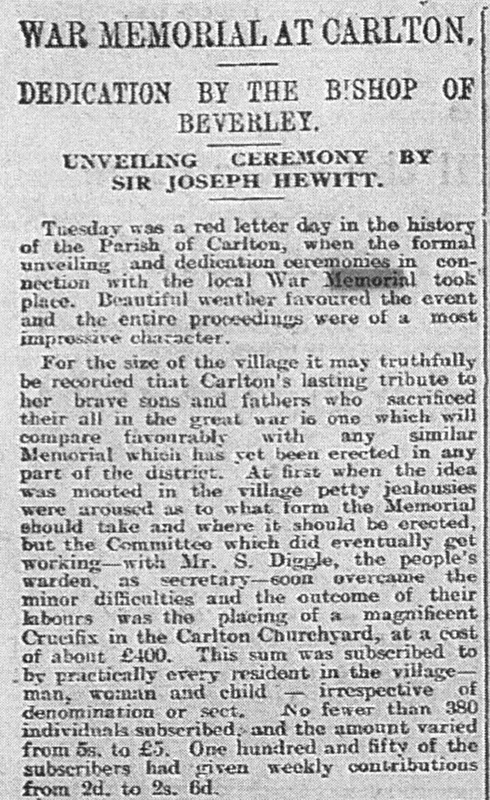 I found a good piece in the digitised Barnsley Chronicle last week relating the unveiling of the War Memorial at St John's church in Carlton, a small village about three miles north east of Barnsley town centre. 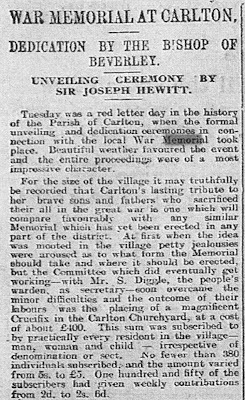 The item was published on Friday 7 Aug 1920 and states that the memorial was unveiled the previous Tuesday. The article records the sentiment that I am finding underlies a lot of the planning for commemoration in Barnsley after the First World War - the community was split as what kind of memorial would be suitable, "At first when the idea was mooted in the village petty jealousies were aroused as to what form the Memorial should take and where it should be erected ..."
I have found that some villages preferred the option of a public park or cottage hospital or homes for disabled soldiers. As I am still only beginning my research it will be interesting to see how many of these alternative proposals were carried through as the standard monumental style of war memorial seems fairly common around the area. There are already pictures of the Carlton War Memorial and a transcription online on the Genuki website. It has not been my intention to 'reinvent the wheel' at any point in my research, however it is very satisfying to go and actually see a memorial yourself rather than relying on other people's work. Plus I wanted to add the memorial to the War Memorials Online website and I could not do that with someone else's photos. There are 52 names inscribed on this memorial for men who lost their lives in the First World War and 20 for men from the Second World War. 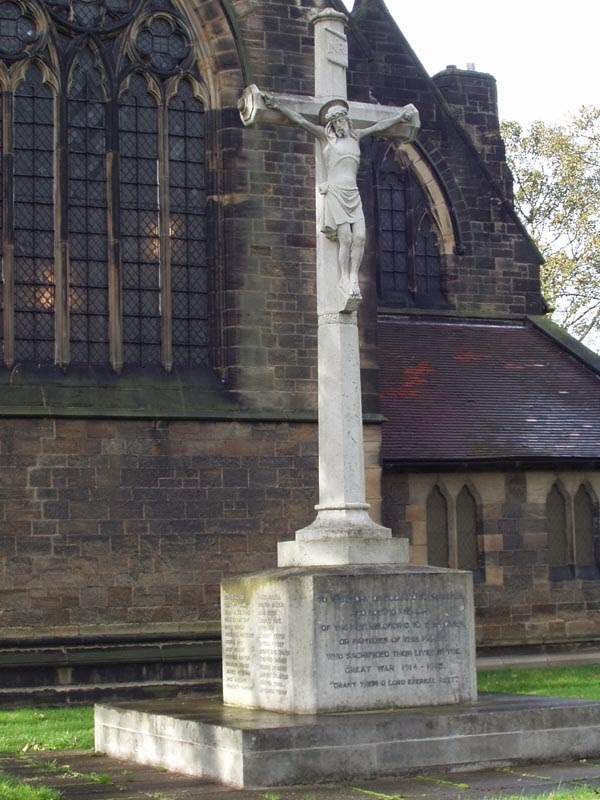 The entry on War Memorials Online has now been created and has a short description of the monument and a list of the all the names. In my reading of the Royston book about the First World War, which I wrote about two days ago, I found a mention of a brother in law of the OH's great grandfather who lived in Carlton. It seems to have been taken from the local newspapers so I have a note of the dates and will be looking that up on my next visit to Barnsley Archives! Royston have their own War Memorial and I will be looking at my pictures of that next.